The CZ1892 is the ultimate package in our incredible TraceAll range. Designed to suit every locating and tracing situation, you'll never find a better tool than the CZ1892 TraceAll Complete System kit for the job. The CZ1892 TraceAll is for the tradesman that needs everything! This complete tracing system is suitable for both indoor and outdoor work, and the variety of products included in this kit ensures that you will always find what you need to get any job done. The TraceAll Complete Tracing System combines the high powered TraceAll Base Transmitter, Circuit Tracer, Inductive Coupler, Coupling Clamp and lightweight Tracing Wand. The CZ1892 TraceAll has full indoor circuit tracing capabilities, allowing the user to locate circuit breakers and fuses on switchboards and general purpose outlets (GPOs) on the wall. The Circuit Tracer can also be used to trace and locate all internal services such as data, electrical, television and telecommunications cables, as well as gas and water pipes inside walls. The CZ1892 TraceAll also has complete outdoor pipe and cable locating functionality, allowing contractors to locate and trace cables and pipes before they even start to dig, thereby significantly reducing the risk of expensive, and sometimes deadly, contact with underground services. It has the capacity to locate cables and pipes to a nominal depth of 2 metres and can trace beyond a length of 2km, in good soil conditions. This kit features the most accurate and flexible circuit tracer on the market and provides the user with full control of functionality, ensuring that you have the best outcome when locating services. Incorporated as standard is manual sensitivity control, an essential feature for eliminating ghost signals when identifying fuses. Both static and magnetic receiving modes are also standard, ensuring cables can be traced even when they are not carrying current or are behind screens such as foil insulation. You can use Normal mode to trace cables through plasterboard and brickwork, and use Screened mode to trace cables concealed by metallic screens such as in wall installation. The transmitter has Low, High and TracePlus modes for near, far and multi-service locating. 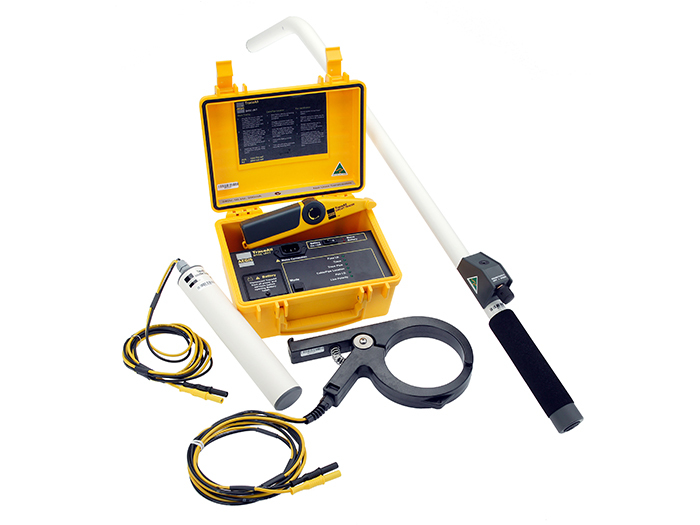 The Cable and Pipe Tracing Wand included in this kit is a receiver wand used for locating underground services, from lead in pipes and cables to main trunk lines. Simplicity is the key with this wand - it only has one control to turn the locator on and provide signal strength control whilst in operation. The Inductive Coupler also included in this kit is an inductive antenna accessory used to put a signal on any pipe or cable without having to make direct connection to that pipe or cable. You can simply plug the Inductive Coupler into the transmitter and your signal will be transmitted onto your target pipe or cable. The Coupling Clamp in the CZ1892 is a rugged signal transmitting coupling clamp. It induces the signal transmitted by the TraceAll Base Unit into metallic pipes or cable services passing through it without physical connection.